The new Bosch Rapid Electric Shredder with a 2200W Bosch Power-Drive motor provides high torque cutting power to effortlessly and efficiently shred branches of up to 40mm diameter. The innovative funnel design with a large hopper inlet, combined with the plunger, allows fast feeding of large amounts of material at up to 90kg/hour without compromising safety. The new laser-cut precision blade is made of specially hardened steel to deliver outstanding cutting power and up to 70% longer service life than other, older models. 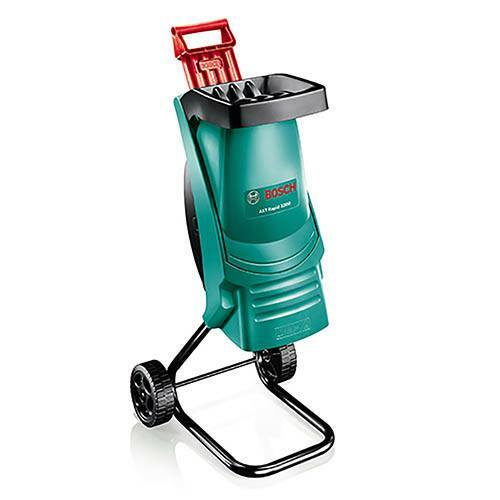 Weighing only 12kg the Bosch AXT Rapid 2200 Shredder is extremely mobile and is supplied with a robust wheeled stand for greater stability. Easy to use, the feed funnel is easily removable and additional safety features include an overload cut out to protect the motor and gears, as well as anti-start-up protection to provide extra safety in the event of a power cut.